There are some versions of the derivative sources of the name Iragbiji; the actual date of adoption of the name is not known. The first settlers had their habitation under an IRA tree. The founder who was a great hunter, during his hunting exploits climbed Ori-oke and sighted an animal, it ran into a big deep hole on the top of the hill. The hunter entered the big hole with the animal in order to kill it. He pursued the animal inside the hole until both of them came out through another big opening in the front of the present Iragbiji Town Hall before the animal was eventually killed. This big hole, an historical monument, has been closed up with stone and cement at present. The hunter, who eventually settled under a shady tree called IRA and other settlers joined him. The legendary IRA tree under which he settled later metamorphosed into what is today known as IRAGBIJI, a settlement under a shady tree. IRA tree and which ``IJI`` (shade) had allowed many people to settle underneath. That is from IRA-GBA-IJI to IRAGBIJI. This is a popular appellation of Iragbiji, meaning Iragbiji made up of two rocks male upon the female, alongside the bank of River Aagba-osun. 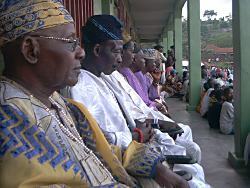 There was an historical event that led to this appellation during the reign of Late Oba Oloyede Dada. Many towns and villages surround Iragbiji. One of these towns is Obaagun. (About 4km from Iragbiji). During the early reign of Late Oba Oloyede Dada, there arose a boundary dispute between the Aragbiji of Iragbiji and the Olobaagun of Obaagun. On this disputed piece of land were situated two huge rocks, one upon the other like a man upon a woman. The Aragbiji laid claim to the land and the Olobaagun also affirmed claim that the land belonged to him. 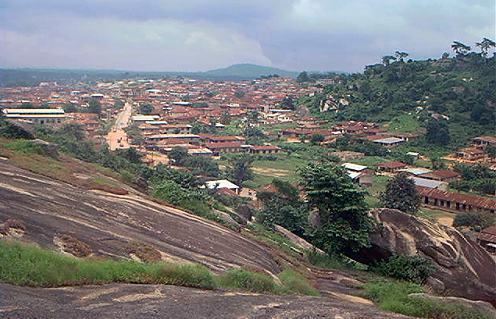 The then Resident Officer in charge of Ibadan Division set up a tribunal to decide the ownership of the land. Then, the two warring parties were invited to the disputed area. In short, the then Aragbiji, affirmed that without any controversy, the land belonged to him and if it was so, let one rock fall down within seven days. This was received with joy by the then Olobaagun because he believed that no Jupiter could bring the rock down from the top of the other one. On the seventh day, when the people gathered again on this disputed land, to the amazement of all those who were present, the upper rock had fallen down on its own, according to the pronouncement of the Aragbiji. The District Officer then said in his judgement that truly the Aragbiji of Iragbiji was indeed the owner of the land. Since then, there was no more controversy over the ownership of the land, Iragbiji was tagged – nicknamed ``Iragbiji Oloke meji tako tabo lori aagba okan yi lule o ku kan``. Ori-oke festival is the most important traditional festival in Iragbiji. It is an annual festival celebrated after Egungun festival. 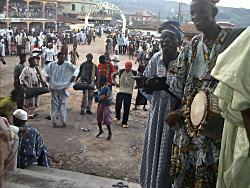 Ori-oke and Ogun festivals are celebrated in remembrance of the founder of the town in the month of July every year. The arrangement is such that it coincides with the arrival of the new yam. It is a taboo for the Priests, the Aragbiji of Iragbiji and all members of the Ruling Houses to eat the new yam or offer it for sale in any market in the town before the festival is celebrated. On the festival day, early in the morning, the Chief Priest ``Aboke`` will come to the palace for prayer and he will be provided with the following things: black goat, kolanuts, ``akara`` (baked beans) hot drinks and palm oil to be used for the sacrifice at Ori-oke shrine. After this, he will leave for the shrine with other Priests to perform the sacrifice while awaiting the arrival of the Aragbiji and his chiefs and entourage at the shrine. In the palace, the Oba will entertain all the traditional chiefs and invited quests with foods and drinks. The guests include some important personalities and traditional rulers within and outside the state. Ori-oke festival period is the time all sons and daughters of Iragbiji from all walks of life come together and celebrate the festival with their Oba and later in the evening pay homage to the King. In the afternoon, around 2 o'clock the Aragbiji of Iragbiji and his guests will leave the palace for the Ori-oke shrine with dance Bata, Dundun Sekere and Aro.. 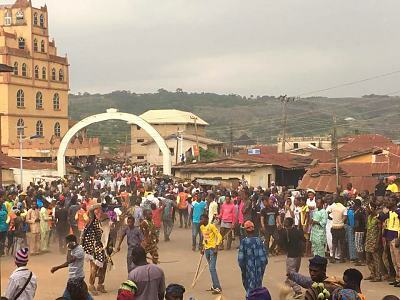 The shouts of ``Kabiyesi’’ will rent the air along the major roads and streets leading to the shrine. The first point of call is ``Odo Oleyo`` (Oleyo stream) then Ipomosun shrine (this is a small shrine along the road leading to Ori-oke shrine). Here the Oba is expected to meet with the Priest in-charge and offer sacrifice and prayer for peace and tranquility to reign in the town. After leaving Ipomosun shrine, the Oba and his people will head for the Ori-oke and climb the hill until they reach the top where the shrine is situated. While descending from the hill, the Oba will have to stop at some specific places to offer prayers and worship his ancestors. One of these places is Popo where the Oba is expected to change his dress and the crown. Here he would put on another dress with Iya-Ade which he normally wears once in a year and continue the journey to his palace. At the palace, small crown and go back to Oja-Oba to meet the Arugba. The Arugba must not look back or fall down. The Igba is usually carried by somebody from girl. The Arugba will come and pay homage to the Oba and bless the entire town. While going, people will be struggling to torch the calabash, the general belief is that anybody that torches this calabash especially the barren will be fruitful and bear child during the next Ori-oke festival. After receiving the Arugba, the Oba finally leaves the Oja-Oba for his palace. The festival will continue and ends on the seventh day at the palace where the Oba is expected to bring out all his crowns including the ones he inherited from his forefathers for sacrifice by the Chief Priest to round up the festival. This is another important festival in Iragbiji. During the Ojolikoko festival, the date of commencement of Egungun festival would be formally announced. Egungun festival is celebrated in Iragbiji in remembrance of their ancestors. The festival always comes up in the month of May every year. 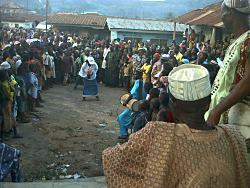 The Egungun festival usually spans seven days. The seventh day is the D-day. It is the day to round up the festival with the convergence of all the Masquerades at the Oja-oba to entertain the people while the Aragbiji of Iragbiji and his chiefs will be on the ground in Oja-oba from 5.00 p.m. in the evening to receive them and perform the traditional blessing. Oguntunde brought Gbegbe Masquerade, the then Jagun Kaoko from Nupe land. 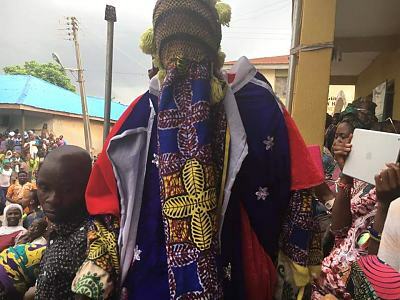 This is the oldest, the most popular and the leader of all Masquerades in the town. 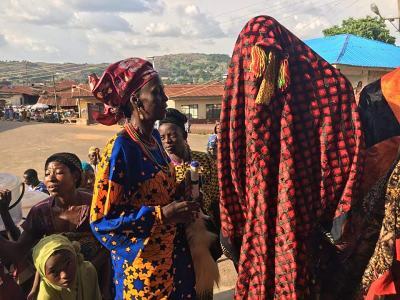 The Gbegbe Masquerade is the last to come for the traditional blessings from the Aragbiji of Iragbiji and his chiefs at Oja-oba after which no other Masquerade can appear in the market again. 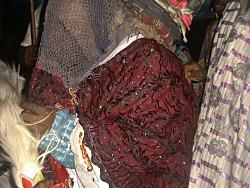 The appearance of Gbegbe Masquerade at Oja-oba is the end of the Egungun festival for the year.